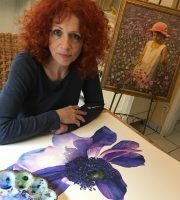 When we create a flower paintings then we need to make sure that the flower, the leaves and also the background build a whole. We need to make sure that we create colour harmony. The complete flower painting shouldn’t look like a puzzle when we are finished. So how do we do that? 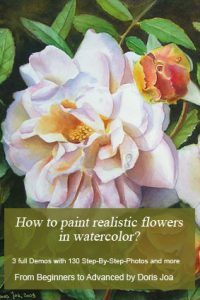 How to create colour harmony in flower paintings? How to integrate the flower into the background? 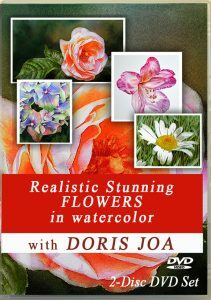 When I paint a flower I always start with my main subject first – the flower. I then switch over to the leaves and start with my first washes there. Then I work again more on the flower and then I start early with the background. At first I make sure that I use the same colour palette on all of these subjects, the same blues, the same yellows and so on. I also make sure that I use some of my flower colour (let it maybe a pink colour) on my leaves, too. And I also make sure that I use some of my greens (which I will use on the leaves) on the flower, too. This all creates colour harmony. Make sure that you work with a limited palette. If you are using too many colours you will be overwhelmed and maybe you won’t try to use mixes. When I start with the background I also use the same colours there which I used on the other subjects. Also when I want to create a dark background I then creates mixes which contains some of these colours which I used on the flower and the leaves. I love it to see touches of the leaves green on my flower – I also love it to see touches of the flower colour on my leaves and in the background, too. When my subjects are finished I then need to integrate the flower and the leaves into the background. 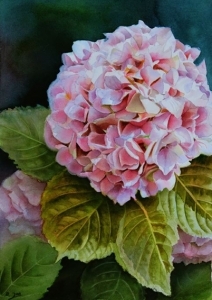 This means that I need to be aware about all the edges, I also make sure that some of the background colour flows over several edges of the flower, especially there where the flower touches the background. Doing this helps to create the atmosphere and depth of a painting. 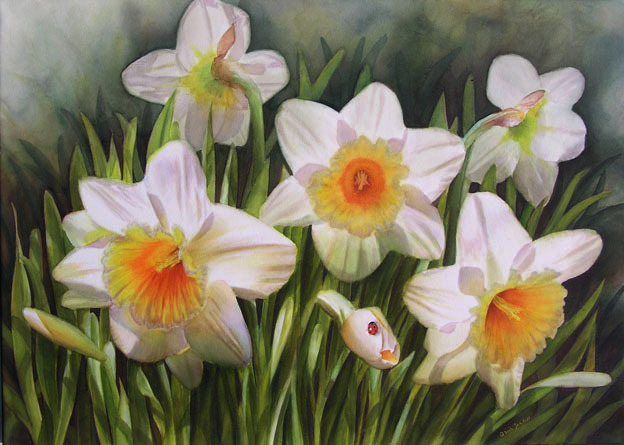 It is important to be aware about how to create colour harmony in flower paintings. Otherwise the subjects don’t fit together in the painting. 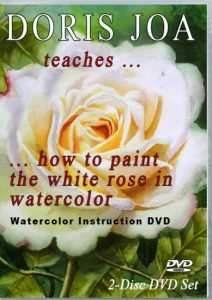 My Watercolor DVD ‘How to paint the white rose’ shows you excactly how I do this. 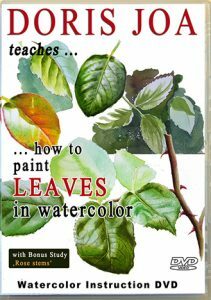 I paint the flower, the leaves and the background and I show you how to put this all together. I show you how to soften the edges and how to create harmony in my painting. 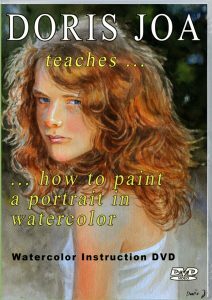 For more Free Tutorials and Step-by-Step-Demonstrations visit the Watercolor Lessons Section of this Website and get indepth instructions with Watercolor DVDs.